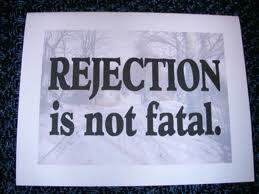 I don’t think that there is a single person (at least not one that I’ve know) who likes to be rejected. It is not something that you look forward to and most people would avoid all instances that would mean that there was a guarantee that they will be rejected. As a writer, it is almost inevitable (unless you are extremely lucky) that you will be rejected in your career at some point, whether it be with the submission of an article, a blog post, a short story, a novel to a publisher, or even by an agent that you want to represent you. As a writer you have to be prepared to be rejected, so much so that you should probably just prepare a box for the stacks of rejection letters that you are bound to receive. Being as though it is almost June and six months into the year that I thought was really going to be a turnaround year for me I’ve been looking over all of my lists of things I was supposed to accomplish this year. I was supposed to live a more fearless life this year and I was supposed to have a more productive year. Looking at my list and just how little I am able to check off, I would say that I have not lived up to my own expectations for the year thus far. A big part of my list was to submit my next novel to agents and publishers and also to start submitting more articles to local newspapers. A huge part of the reason that I have yet to submit my work is because I fear the rejection letters that I will be sent. I know that you are not supposed to assume that your work will be rejected but it is really hard not to prepare for the worst instead of hoping for the best. The thought of someone saying my work isn’t good enough is like someone telling me that I am not good enough and that is what hold me back. I was reading the Writer’s Digest magazine and in the back of every issue they highlight a rejection letter to a famous author (when they weren’t so famous) and you get to see that even the authors that are seen as the greatest authors of all have been rejected. I have read many of these letters but the one that shocked me the most to read was the one I read for Charles Dickens “Great Expectations”. In it the editor essentially called his work boring and too descriptive, on top of telling Charles Dickens that he was seemingly a pervert and that this novel was only good for burning in a fireplace. I felt like it was so harsh and by far the worst one I have seen but it also made me think, “well it had to be worth something in this editor’s eyes because this letter was so personal for it to be a rejection letter.” You could tell by reading it that this was not a book that (as bored as she said she was with it) the editor just read for a little bit and got midway through and then tossed it in the rejection pile. Details mentioned in the rejection letter suggested that they apparently thought enough of it to read it all the way through. It was exactly the kind of rejection letter that I had always said I never wanted but now I’m not so sure. In reality I should be looking at rejection letters as a statement of what it would say about me. It would say that I put myself out there, as difficult as it is to be vulnerable, I would have been brave and fearless about my work. In some cases rejection letters (when personalized instead of generic) means that someone thought enough of your work to actually write the rejection letter with their own personal touches. If even the greatest authors have been rejected, what would make me any different? I have to get past that fear because it is only holding me back even further. The sting of rejection is what you have to come to grips with when you are willing to take risks. Otherwise, all that means is that you never took the risk. Sure that means that you won’t have to worry about feeling rejected, but you also won’t run the risk of actually being accepted either. Everything is a risk in life, not just the bad but the good as well. You can never really enjoy the good that is due to come your way unless you are willing to accept the possibility of things turning out bad. So the next time I feel that fear of rejection when I want to submit my work, I am also going to put into perspective the good that I might be inviting my way as well. Write 2 Be Magazine is now out so please go check it out at http://write2bemagazine.com/. Also please go and join the magazine on twitter https://twitter.com/write2bemag, join the email listing for the magazine or submit a request for an author interview at Write2bemagazine@yahoo.com, and also like the Write 2 Be Magazine fan page https://www.facebook.com/Write2BeMagazine. Please help support my endeavor and my new journey and help me spread the word about Write 2 Be and its meaning.